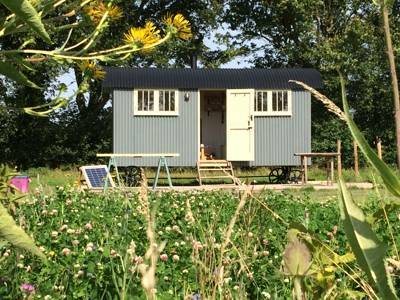 Ivy Grange Farm is a gorgeous spot, they have four yurts and a romantic shepherd's hut and they are offering a 10% discount on stays of 2 nights or more until the end of June using the "CoolPlacesOffer" code. To claim your discount, enter CoolPlacesOffer in the notes comments section and opt to pay by bank transfer, the total amount will be adjusted after your reservation is made and confirmation by the owners will show the discounted rate and will include a link to pay by card". Great for a family of three with a gorgeous red wool lining around the walls and a pale linen colour on the roof, there is also a wood burning stove. 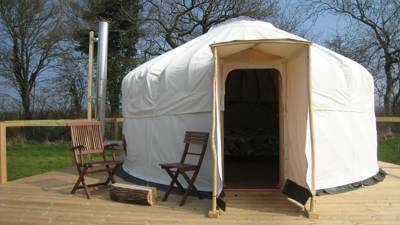 The yurt it furnished with an elegant French double bed with upholstered headboard (including gold braid! ), a comfy futon chair/single bed and a lovely dresser. 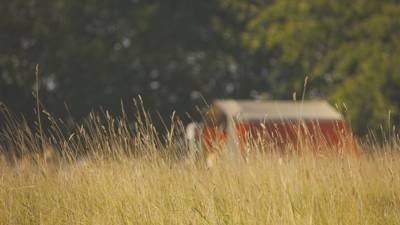 London media world refugees Kim and Nick Hoare have created a real slice of rural bliss just outside the small Suffolk town of Halesworth, where 4 yurts and a new Shepherd's Hut form the nucleus of their thoughtfully planned glamping site. It's a place where attention has been given to every sort of detail, and the enthusiasm and passion of the owners shines through at every turn. 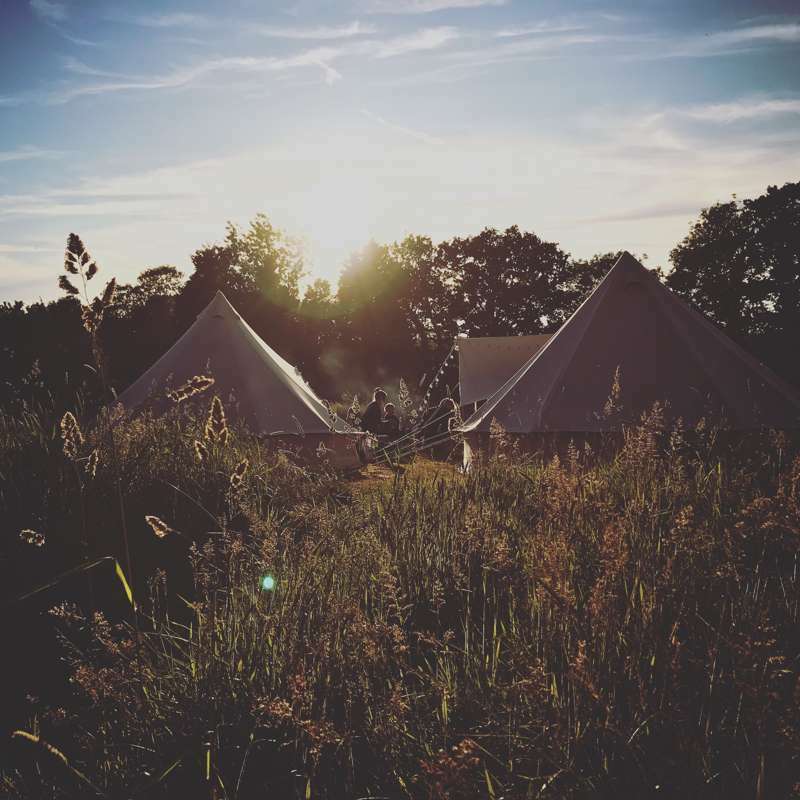 The yurts are beautifully furnished, with their own wood burners, big comfy double beds and pull-out futons, plus outside decking with a gas hob and open fire pit – great for taking in the sunsets with an evening glass of wine. The shepherd's hut, meanwhile, sleeps up to three, with a fitted double bed at one end and a smaller futon-bed at the other. It, too, has a wood-burner and quaint little touches wherever you glance – old taps have been transformed into quirky lighting and a stack of novels lies in wait for rainy days – while all of the glamping accommodation has access to a wonderfully well-appointed open kitchen for the most sociable dining. In addition to the three-acre field, there's a restored barn with tables and chairs, a lovely woodland (i.e outdoor) shower, supplied by solar-heated hot water, and you can pick the produce you need from their well-tended vegetable troughs around the barn – a blackboard inside lists what's ready for harvest that day. It's all brilliantly done, and perfect for family groups or indeed groups of families. 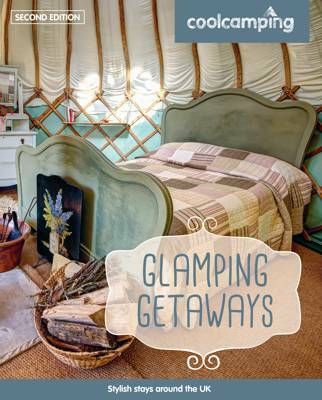 For latest availability and best prices for Ivy Grange Farm Glamping, please use the Date Search above. Tranquil campsite in a lovely spot in Suffolk. Friendly and family orientated, helpful owners without being overbearing and ecologically aware. We stayed at Ivy Grange Farm in Lapwing Yurt in May 2014 for a week, we being me, my wife and two boys aged 4 and 1. Nick and Kim were the most generous of hosts in every way, and had really put so much thought into the needs of their guests on all levels. The Yurt itself was sumptuous inside, and we felt really spoilt. Though we didn't use the wood burner due to having glorious weather, had it been cooler we would have loved having the warmth and comfort that this would have afforded. Cooking outside on the decking was a real treat. Usually when we camp we squat round a trianga stove, and much as I love these, cooking with children can be hazardous and with the provisions here we were able to cook worry free, while the children played on the decking and in the meadow. When it did rain we were able to cook under shelter provided outside the old barn, which had now been turned into a lovely shower block which was clean and warm at all times, with plenty of space to put your belongings, and baskets too to leave things there. Brilliant. The barn also provided a huge games room / reading and dining area. The games room was traditional with board games / table football and table tennis i.e no computer type games you may find at other sites which have games rooms, which was bliss. At night there is no light pollution so You can star gaze while sitting round a traditional camp fire. The children loved this as did we. We cannot praise Nick and Kim highly enough who were very thoughtful and kind with us and our boys. In fact they invited our older son Elijah to help them make a cob style wood burning pizza oven from scratch, and turned this into a dragon which he then named. He has wonderful memories of this as do we. If you are cyclists the lanes around are wonderful to explore, and safe. We had our four year old riding on the road for the fist time, with vehicles showing great respect. In the future we hope to return and wish Nick and Kim all the success they deserve in such a worthy venture. Here you will find a slower pace to life which many of us require in the modern world. Nick and Kim have provided a space in which individuals may re-connect with themselves, families can re-connect with reach other, and all may immerse themselves in the peace and tranquility of nature as it is mean to be experienced. Thank you to you both. 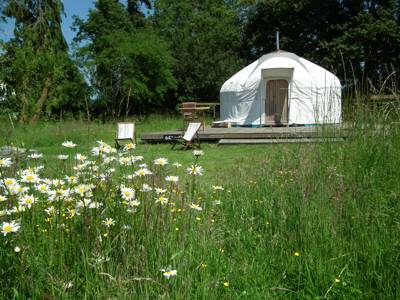 We stayed for 4 nights in the lovely Yellowhammer yurt, during a week of uninterrupted Suffolk sunshine. 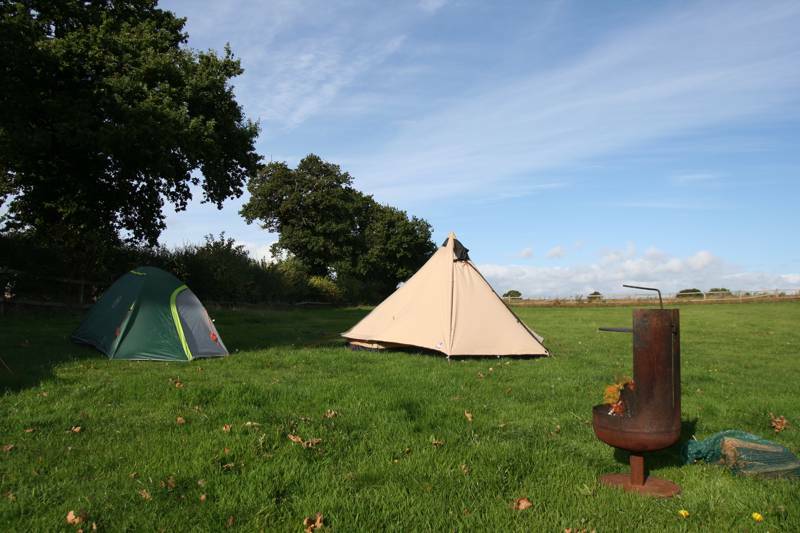 Yellowhammer was very spacious for the two of us, and would also be great for a family of 3 or 4 (as mentioned by another reviewer above, the Barn Owl yurt or the bell tent would both be roomy enough for a couple). 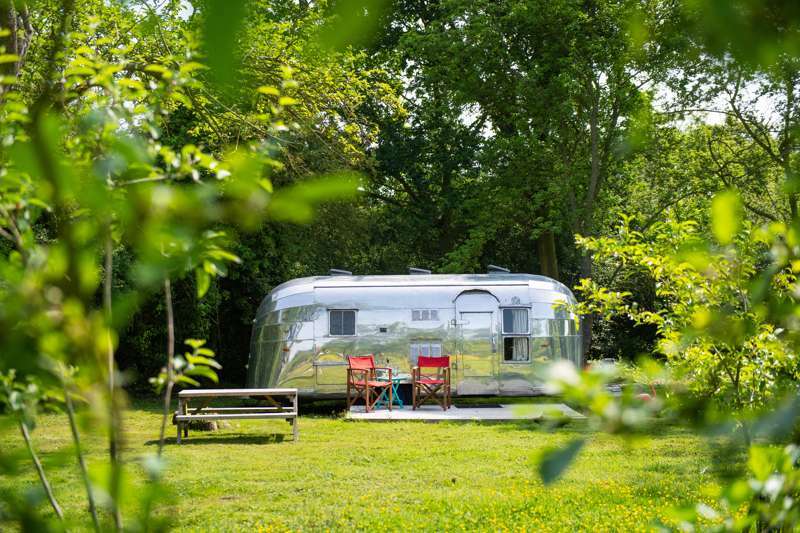 The friendly, attentive owners Nick and Kim have thought of everything to make a stay at Ivy Grange Farm enjoyable and relaxing - their attention to the details really stands out. The yurts are decked out to a very high standard and make a great romantic cosy hideaway - and they're spaced out such that you feel like you have your own private area of the large field (but not too far to wander across to neighbouring yurts if you were staying as part of a group). We loved the Yurt's decking area and al fresco dining (open fire pit for BBQs, plus outdoor gas stove). The overall facilities are fantastic; the communal barn is a beautiful old building and the outdoor showers were hard to tear away from! It was a really nice touch that several bikes were available to help yourself to, and the quiet lanes for miles around are excellent cycling territory. We'd return in a heartbeat !! We stayed for 3 nights (originally booked in for 2 but we loved it so much we booked in for an extra night!). This really is a special place; tranquil, peaceful and very far away from the London we left for a few days. 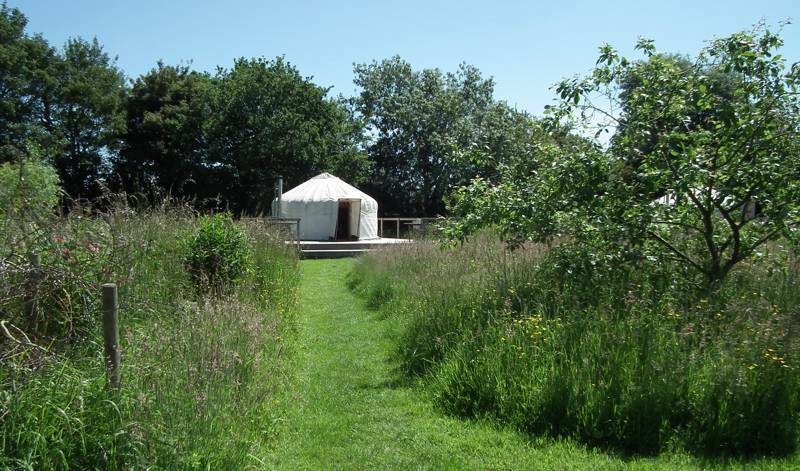 The yurts are not only beautifully decorated but really clean and well kitted out with everything you would need. We loved the al fresco cooking and being able to pick and cook the vegetables / herbs / fruit from Kim&Nick’s various vegetable patches around the meadow. Kim and Nick are wonderful hosts, genuine, friendly and helpful. We look forward to our next visit! We loved our little Woodpecker Yurt! Surprised my fiancee with a 3 night break at Ivy Grange Farm and we both had an awesome time! Nick and Kim were lovely hosts and even picked me up some (delicious) bacon from their favourite butcher before we'd arrived! The nearby countryside is perfect for a bike ride (bikes can be hired free of charge!) so I would definitely recommend that if you stay here you make use of the bikes and the surrounding area! We stayed in Woodpecker Yurt which was very luxurious and probably a little TOO big for just 2 people but it was really nice to have the extra space. The weather wasn't amazing and we had some heavy rain, but nothing beats cosying up by the wood-burner with a couple of mugs of tea and listening to the rain tapping on the top of your little home. PS: Barn Owl looked perfect for couples, we would probably save ourselves a bit of money and book there next time!